The transfer window is now shut thankfully! And with it, any player speculation for the remainder of the current season. Nothing major or unexpected has occurred in January. With Eboue Kouassi the only player drafted in by Celtic, I was more pleased to see some players heading out. Eoghan O’Connell (Walsall), Jamie McCart (Inverness), Theo Archibald (Albion Rovers), Joe Thomson (Queen of the South), Ryan Christie (Aberdeen), Aidan McIlduf (Queens Park), Kristofer Ajer (Kilmarnock) and Leonardo Fasan (Port Vale) have all gone out on loan until the end of the season. Aidan Nesbitt (Morton) has extended his loan spell, whilst Saidy Janko (Barnsley), Paul McMullan (Dunfermline) Colin McCabe (Stenhousemuir) and Jamie Lindsay (Morton) continue their season long loans. Moving on is Irish youngster, Michael Duffy who has returned to Ireland to play for Dundalk. For those with Celtic contracts ending in the summer, it is almost certainly the end of their careers at the club as well. 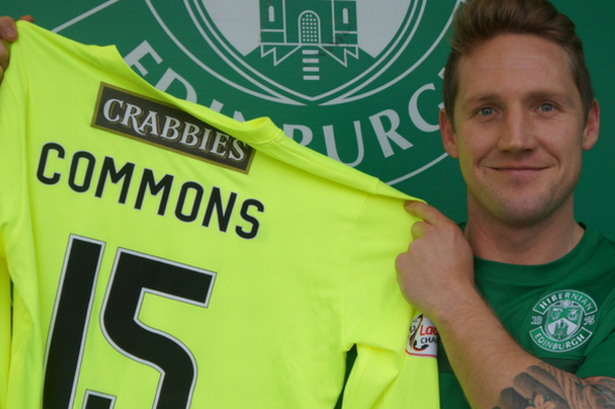 Not going out on loan spells are Kris Commons, Nadir Ciftci or Efe Ambrose…or is he? Commons will leave in the summer when his contract expires and Ciftci still has two-and-a-half years left to run on his deal but he is almost certain to have that cancelled if he fails to find a suitor. For Efe it looked as though the transfer window had slammed shut on his fingers. Apparently the deal is not yet dead though so we may be bidding farewell to him before the summer. Even then, I’m sure the club will be sweeping up Efe’s debris long after he’s gone. He’ll be haunting people in the corridors of Celtic Park for years to come! Slowly, but surely the squad size will be coming down because. This needed to happen, but in turn the quality needs to remain high. With Moussa Dembele and Craig Gordon linked with Chelsea in the window, it was reassuring to hear they were both staying put. There’s nothing to say that, that might change in the summer, but for now they are both still Celtic players. The lure of London, the Premier League, Antonio Conte’s aftershave and a lot of Sky Sports money must be hard to ignore. On planet Celtic though there is a treble at stake and dare I say it a chance to go the whole season unbeaten? Something special is happening at Celtic right now. We’ve seen that in almost every game this season so far. You’d be a fool not to want to be part of it if you are being given the chance. There are some who don’t feature in the long-term plans though. For many of the squad, the season is just beginning as they earn their first minutes on the park under Rodgers. The pack will become tighter as the squad downsizes. We’re not losing quality, just quantity. Some guys will come back and have another crack, some will remain gone forever. The key thing here is that Rodgers has run the rule over this squad. He’s been patient, given many a chance and remained even-handed with his fitness policy. He made it clear that Leigh Griffiths, although a talented player, isn’t doing it right in other areas to be considered his first choice striker. I get Brendan’s stance on this and we saw something similar with Ronny Deila, though it failed to obtain respect and support from some of the dressing room and supporters. Deila imposed a similar regime of health, fitness and lifestyle but his tactics and squad selection would be his undoing. Most of the current squad endured that but it ironically has paved the way for Brendan Rodgers. Griffiths was one of those players, Commons was another. Only one of them still has a shot at a Celtic career. I feel for both guys having both served the club so well. It is obvious though that under modern management at a club like Celtic it is becoming a club standard to shape up or be shipped out. Leigh has a chance and he did seem to take Deila’s advice, eventually earning his place after being out of the picture. Under Rodgers the bar has gone up again though. Whatever Leigh isn’t doing right he needs to change. He is a fine player who has already shown what he can do on a Tunnock’s diet. I hope he continues to work hard and demonstrates his willingness to comply. If he does he’ll be unstoppable and Rodgers will have a pleasant headache. Right now though it seems to be Dembele all the way. Until the summer at least. This was a game that the home side needed to win. And for the opening 30 minutes they certainly gave it a go. Mark Warburton’s players went at Brendan Rodgers players with some purpose. They didn’t allow the visitors to get into their stride and drew first blood as well. You could be forgiven for thinking that this was going to be the breaking point in Celtic’s season…if you were a fan of the home side. That their new Ibrox club were going to be the team to halt Celtic’s unbeaten run in domestic competition this season. However, there was also a sense of inevitability about the match. That when Celtic did get into their stride that they would show their dominance. So whilst Kenny Miller’s jubilation at the opening goal was still filtering through the home crowd, they were unable to follow-up with a second. Celtic were working themselves into the match slowly whilst Warburton hoped another goal would come his way. It didn’t, and Celtic began to settle down. The truth is, that was all it was going to take. To be fair to Warburton, things started well for his team. When Celtic eventually got a foothold though there was no looking back. After half an hour of the home side throwing themselves at Celtic, the Bhoy’s eventually stepped in. Or rather, Moussa Dembele did. A corner from Scott Sinclair found the French under-21 international behind a crowd of players who lashed home a fine effort. I didn’t think Celtic would go on to slaughter the home side but I was somewhat relieved at them finally getting on score sheet. I say relieved because I had spent 5 hours wondering what the bloody score was and avoiding all forms of communication so I could watch the game several hours ‘live’ after I’d finished work. Not good for the soul, I tell you! I wasn’t on my own though. There were others in the same boat as me as we started our Hogmanay early in the evening rather than at lunchtime! After a breather at the interval, we sat down to watch the second half. As the game wore on and chances came and went for Celtic I had the mindset that this was heading for a draw. There was nothing wrong with how Celtic were playing. Despite the dominance the Hoops were now showing, it was just beginning to look as though it wasn’t going to come off on this occasion. That was until my man-of-the-match, Stuart Armstrong slung in a direct pass across goal to find Scott Sinclair unmarked at the far post. Boom! Celtic had come from behind at Ibrox to win the match and with time to spare. As narrow as the score may have been, there were a chances galore for Brendan Rodgers side. The Bhoys showed their class by taking control of the game after a half-an-hour flutter by the home side. Now Celtic sit very comfortably on top of a 19 point lead in the Scottish Premiership. Mark Warburton now has Derek McInnes’ Aberdeen breathing down his neck. The Dons are only 2 points behind second place and with one game at hand. Meantime back at Fortress Paradise, it is exciting times. New contracts are going on the table for current players, new targets are mooted and some players will be moving on. There was nothing scintillating about Celtic’s win over Kilmarnock last night. A single goal decided the match, but this was no easy three points for Brendan Rodgers. In the first half Celtic were dominant with good work rates from Callum McGregor and James Forrest in attack. Despite retaining the ball for long periods though, Celtic weren’t really penetrating the Kilmarnock defence. In fairness to the Ayrshire side, they put up a solid formation, but they didn’t sit back too much either. They hit on the break and put Celtic under pressure at times and probably could have scored a goal or two had it not been from a lack of composure or better fortune, which in this game would have made things more interesting. Celtic had several chances themselves, but composure and luck deserted them on all but one occasion. The second half was a little more feisty with several players becoming involved in mini-tussles. Craig Gordon had a least one blip which could have been worse and Dedryck Boyata, starting his first game under the new manager, looked shaky on more than one occasion. Gordon did recover though but I’m still no more impressed with Boyata than I was when he played under Ronny Deila. Stuart Armstrong also found himself under pressure in the first half a couple of times. He looked like he was wearing the wrong boots….until he scored. 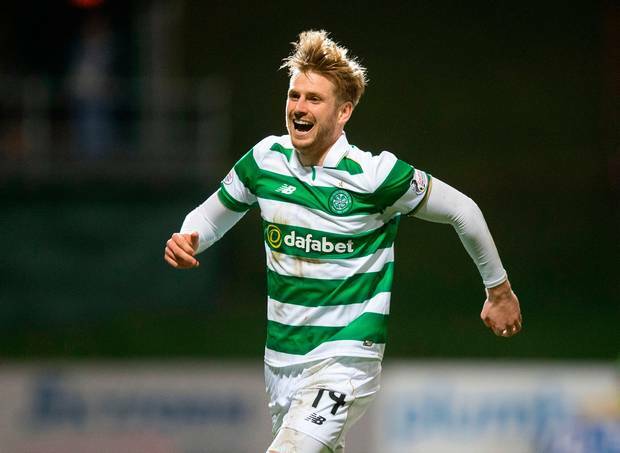 Armstrong, a growing presence in the Celtic midfield these days, put away a tidy finish after a good run and some neat interplay in front of him. His all round game is becoming more prominent in the team with every passing game and he showed that even after a slip up earlier in the game he can retain his composure when required. When you have a young talented player like this in your squad, why would you even bother with Steven Gerrard? We already have one senior midfielder in Scott Brown who is playing his best football in years. And when you consider that Tom Rogic is adding goals, pace and skill in a midfield-attack role, our midfield is looking healthy. Nir Bitton will want to sort out is ailing game and get back in the program because he is slipping down the pecking order and rightly so. So it is another 3 points for Celtic and the gap is widening. Another clean sheet takes Celtic step closer to obtaining another Scottish league record. The rest of the Scottish Premiership are in action this afternoon and on Monday night. 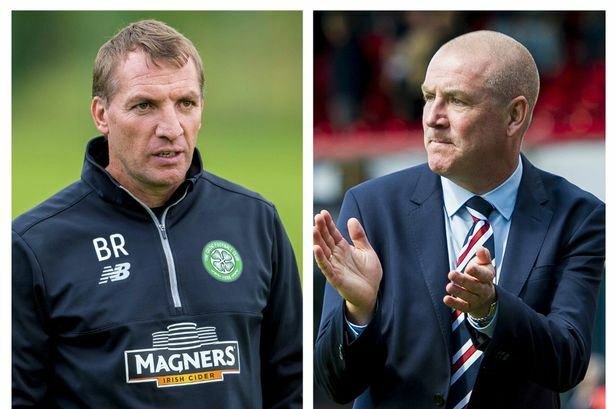 Four teams will be hoping to catchup with Brendan Rodgers runaway train. Aberdeen (2nd) have a tricky one away to Inverness (6th), The Rangers (3rd) have and easy one at home to Dundee (11th), St Johnstone (joint 5th) are at home to Ross County (12th) today and Hearts (joint 5th) are away to Hamilton (9th) on Monday night. With Celtic are 13 points clear at the top of the league, only a point separates second, third and fourth/fifth placed teams. It is that tight and the pecking order could change very quickly. This is an interesting battle as four teams compete to be Celtic’s real contender though at this stage it is looking like the best of the rest. Aberdeen have been that team for a while. Hearts showed their intentions last season. We’ll know by the end of the season just how close The Rangers are to mounting a serious challenge. Right now they are sitting third, but no team is as near as Celtic as they would like to be. 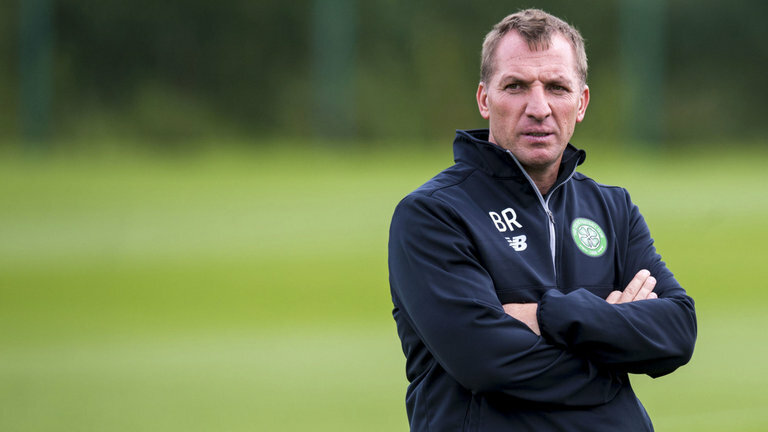 In the meantime, Brendan Rodgers will prepare for Barcelona on Wednesday night in the Champions League. Can he beat the Catalan machine on home turf as his Northern Irish compatriot Neil Lennon did in 2012? Well, let’s put it this way, one win from the last two games is the ONLY way Celtic have a chance of qualifying in third spot. Beating Manchester City away seems like a tough one so why not Barcelona at home eh?